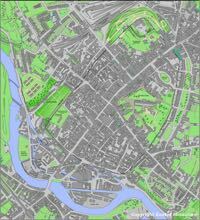 I have tried to select the largest version of each map I can up to a maximum practical size. Not all devices will show them at maximum size, so on a smartphone, tablet or PC, zoom up. Jean (John) Rocque was a French Huguenot brought to England soon after his birth, circa 1709. He became a cartographer, surveyor engraver and map seller. 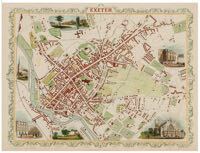 His map of Exeter from 1744 was two years before his possibly greatest work, a map of London. 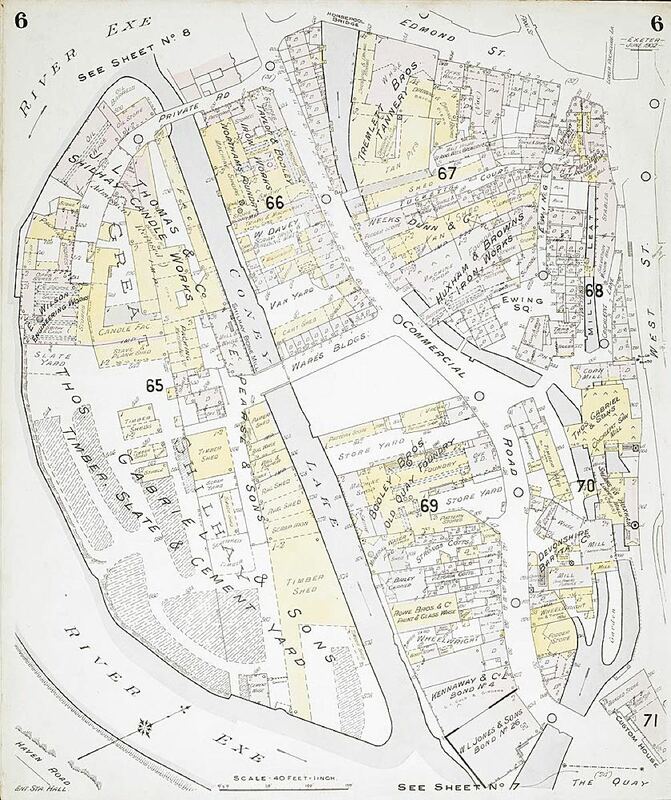 He was noted for including drawings of major buildings around the edges of his maps. 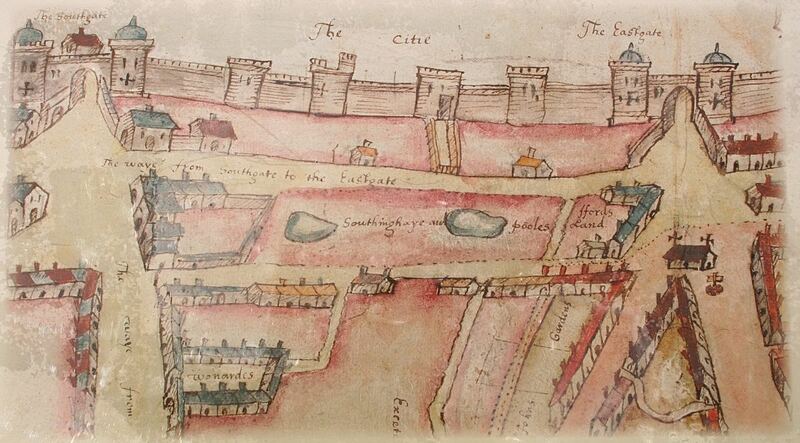 This coloured map show Southernhay in 1590. The small lakes on Southernhay Green idicate that the area was considered to be a recreational area outside of the city wall. 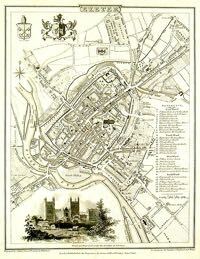 Included are details of the towres and South and East gate along the city wall. 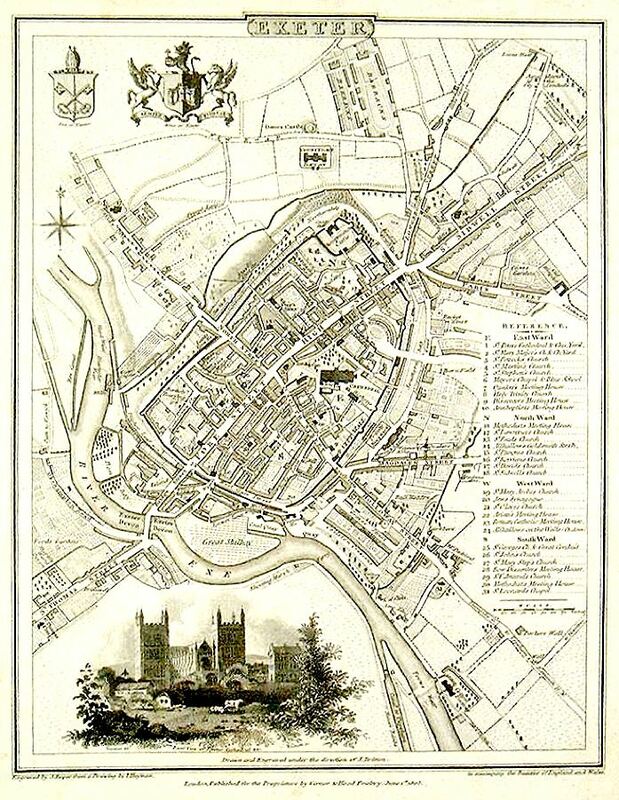 This 1806 map shows some decoration around the map, with an engraving of te Cathedral and the City Coat of Arms. A limited key to notable buildings is to the right. 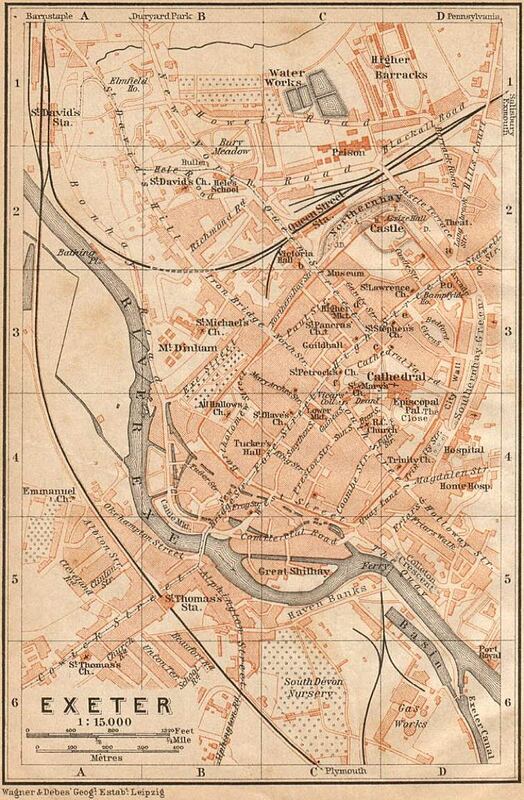 The German cartography company Wagner Debes, from Leipzig, was established in 1835. 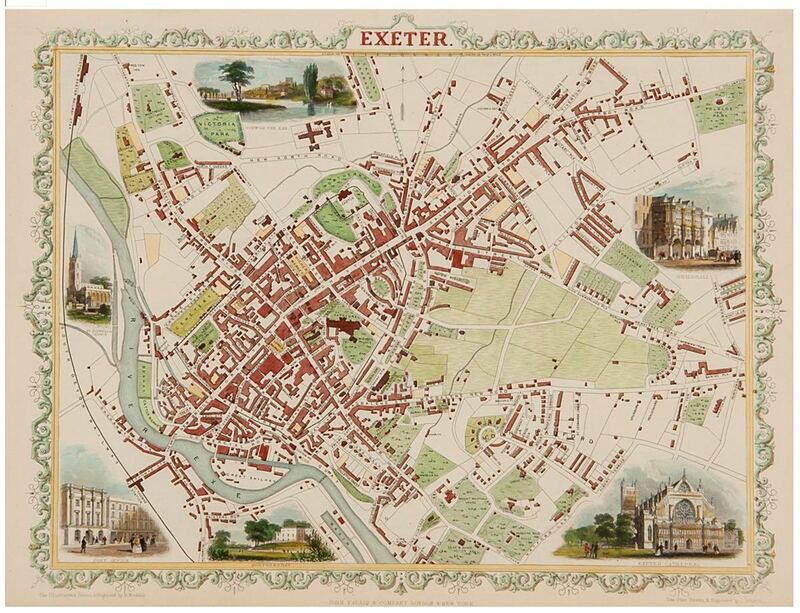 This example of their work shows Exeter, is just after 1905 when the Buller Statue was unveiled. 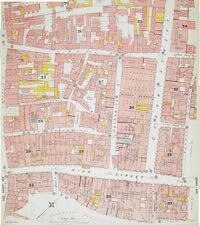 John Tallis with his brother Frederick produced maps between 1842 and 1849 when the partnershipwas dissolved. Tallis continued as John Tallis and Co. This is an example of his work from between 1851 and 1854, and uses the old Rocque's technique of showing views of local buildings around the edge. 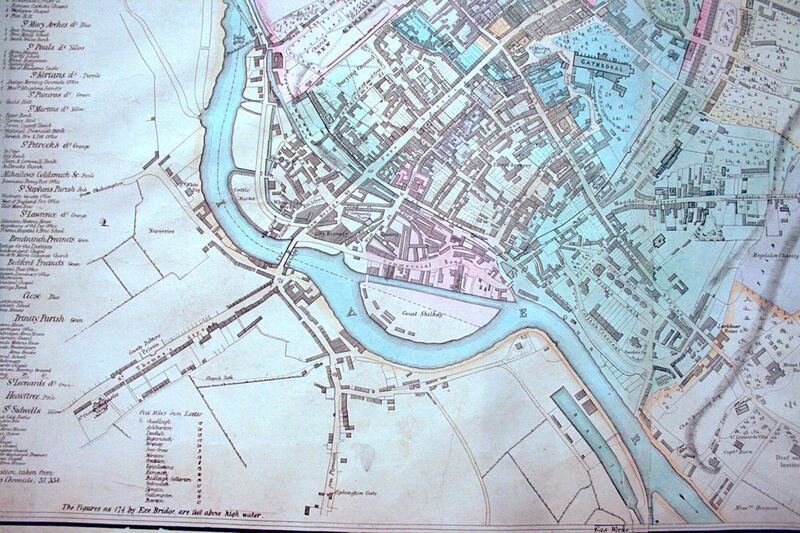 The Ordnance Survey started producing local maps in the 19th Century. 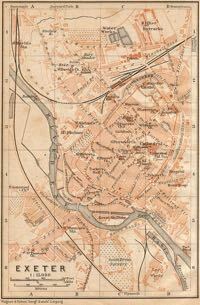 This map, that I produced, is based on the 1890-1905 series. I have redrawn and coloured it for clarity, using the OS symbols as a guide. 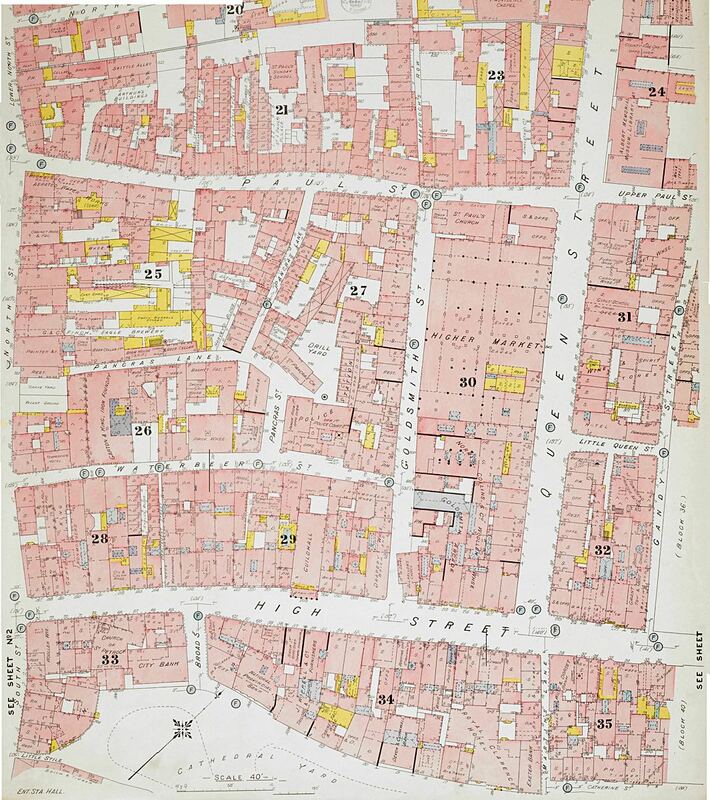 A series of detailed insurance maps of the city were produced in the late 19th and early 20th Centuries. 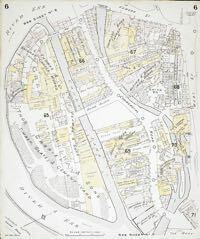 This, probably from about 1900, shows St Martins' Island at the bottom edge up to Paul Street at the top. 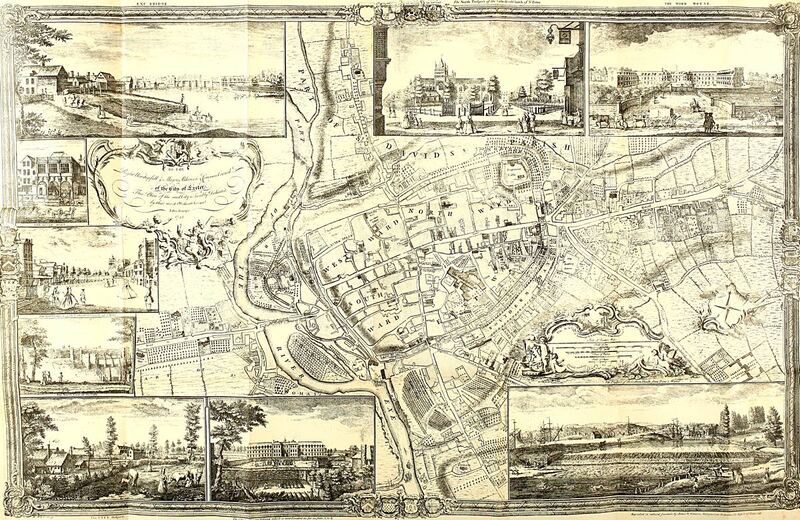 The Higher Market, police station and ST Pancras Church can all be found. 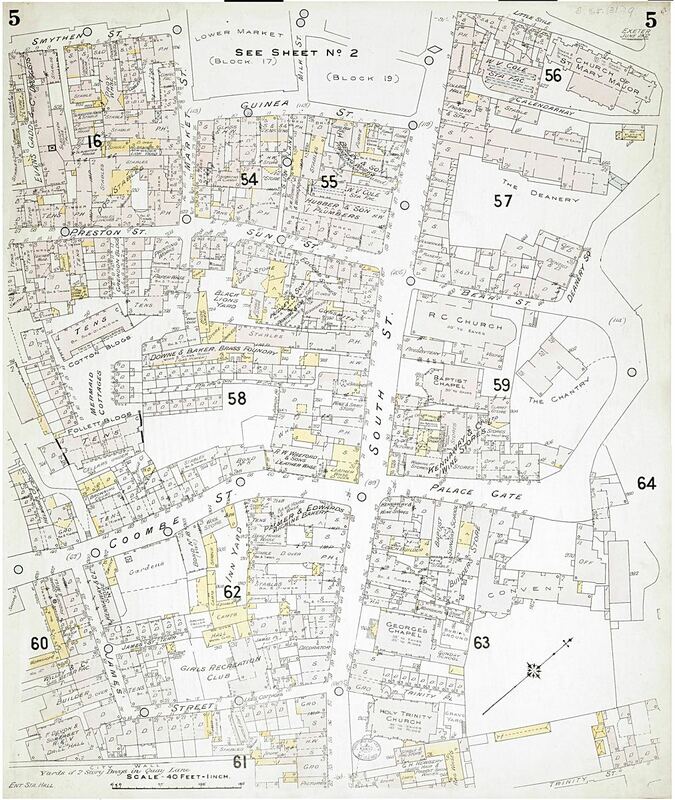 This insurance map of South Street and its environs, shows some streets that were lost in the blitz. 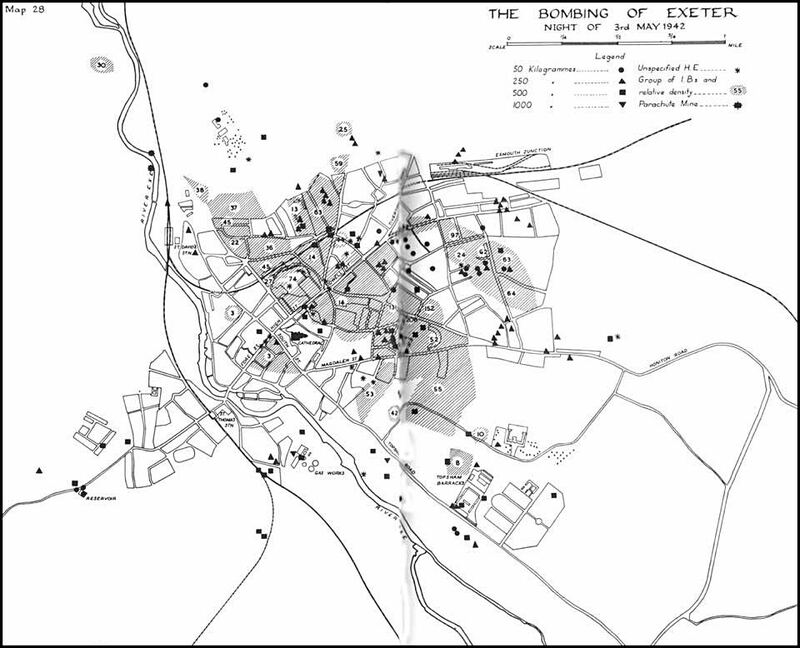 This map indicates use that each building was put to, at the time of compiling the map. Shilhay and Commercial Road are included in this insurance map. 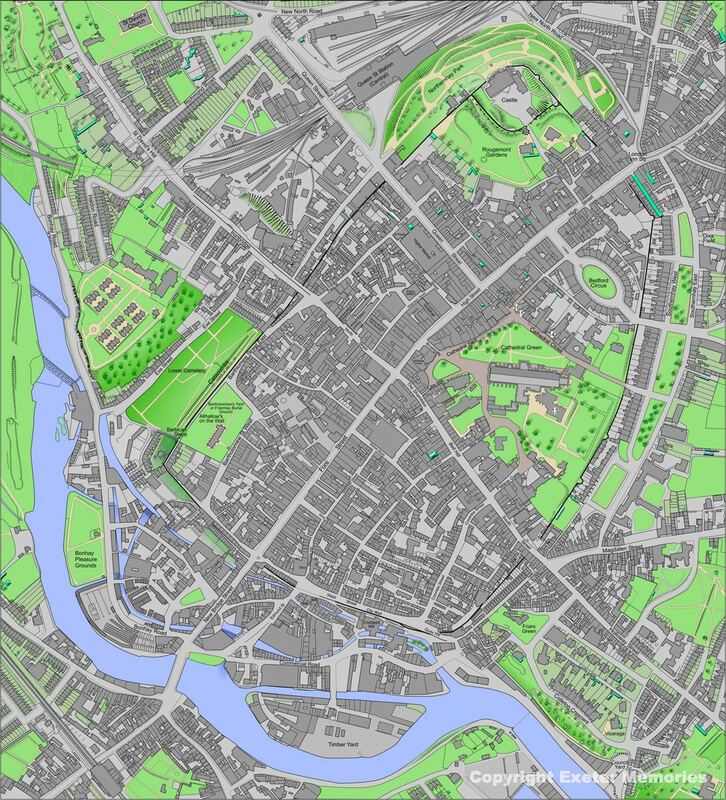 Bodley Bros foundry, Tremletts Tannery and Cricklepit Mill canall be found on the map. 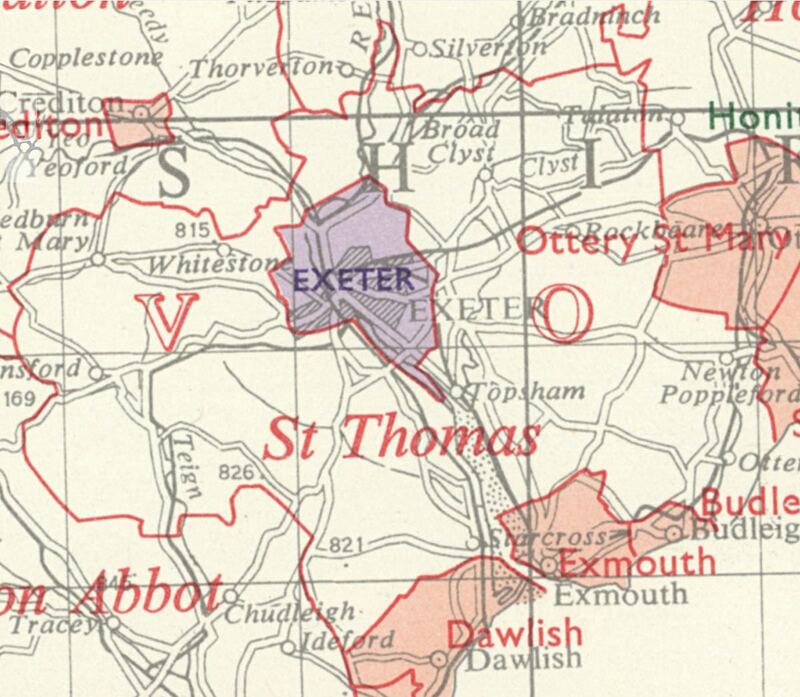 I am not sure who produced this map, but I have included this section of it because it shows an accurate St Thomas from before the railway. The city in the centre coloured purple is surrounded by St Thoams Union, bounded by the red line. 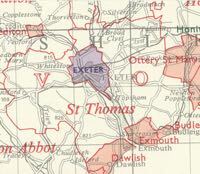 The Union stretched from the Exmouth boundary in the south east to Tedburn St Mary in the north west. 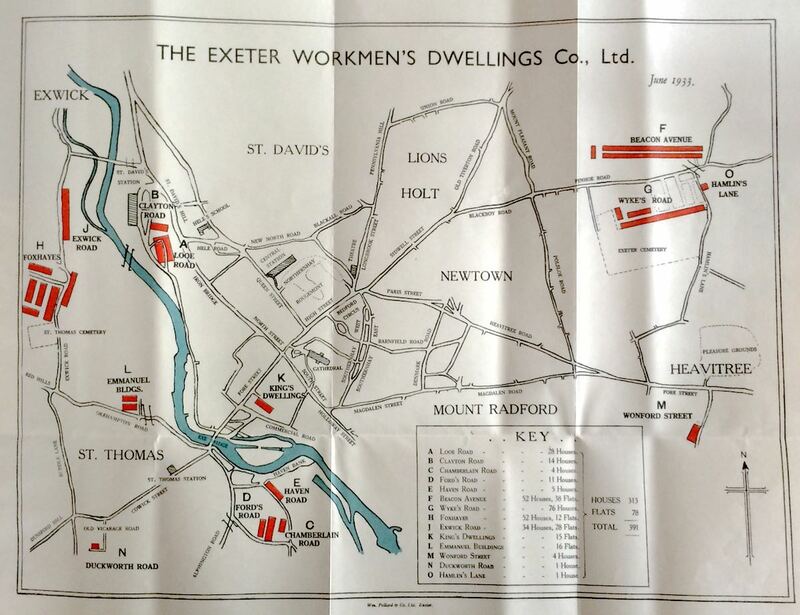 If you were found to be destitute from anywhere in the union, you could end up in the workhouse off Okehampton Road. 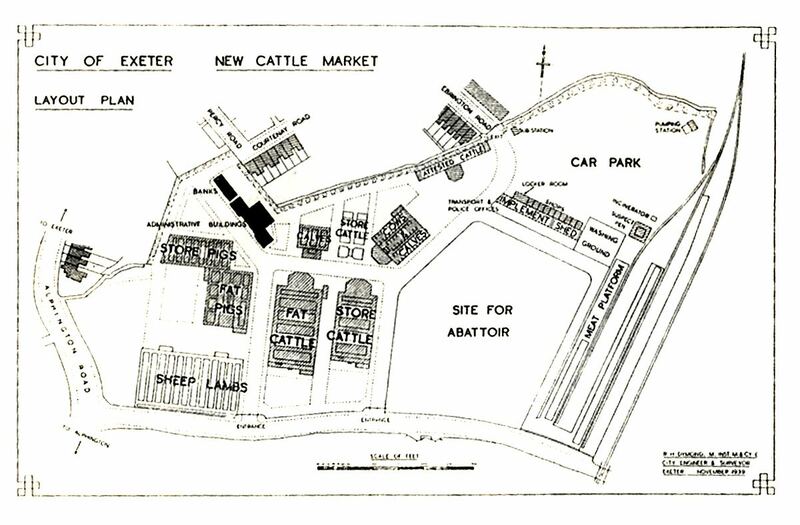 This map was in the special program for the opening of the cattle market in 1939. The abattoir was never built at this location. 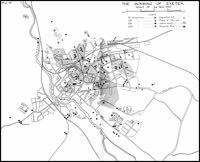 A map showing where each bomb hit, on 4/5th May 1942. 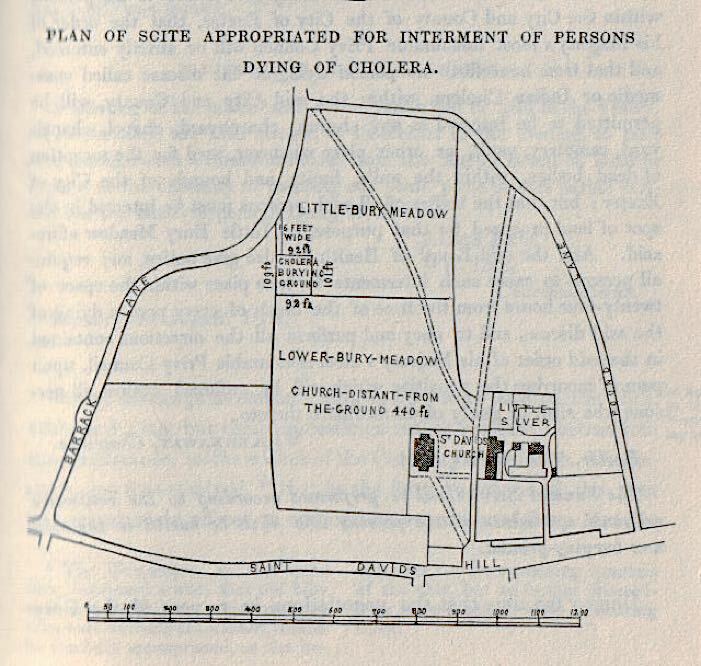 The map of Bury Meadow published in Dr Shapters, 'History of the Cholera in Exeter'. 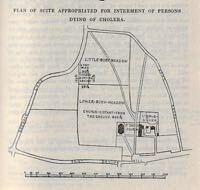 The map was included as it shows where the cholera burial ground was located in Bury Meadow. It is actually under the children's play area. 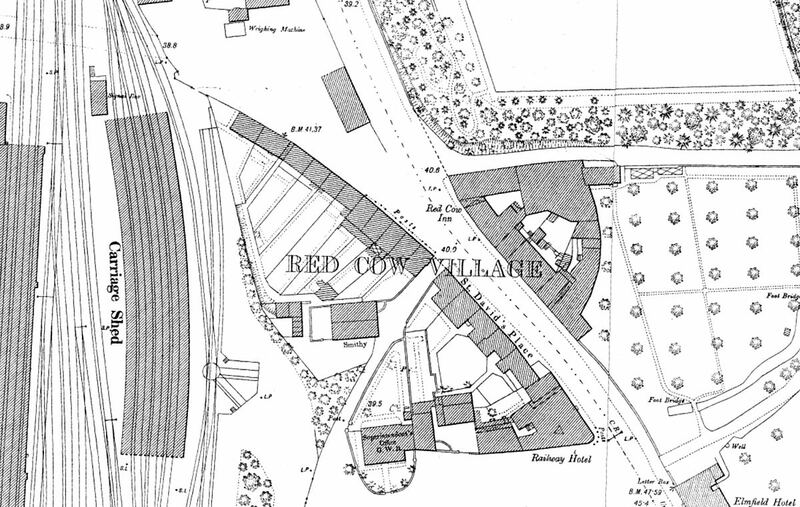 The small hamlet of Red Cow gained importance when the railway came to Exeter from Bristol, and became the terminus now known ast St David's station. 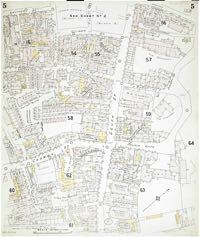 The small rectangular building, centre top, had been the toll house. 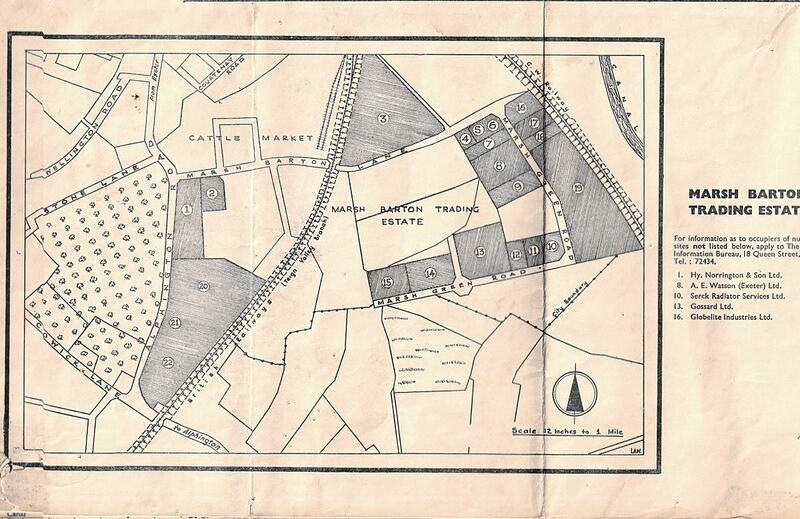 A map, possibly from the 1950s, of the embryonic, Marsh Barton trading estate. 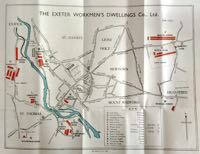 Published about 1935, this map shows the location of all the solcial housing provided by the Exeter Working Mens' Dwelling Co,. which eventaully became Cornerstone. 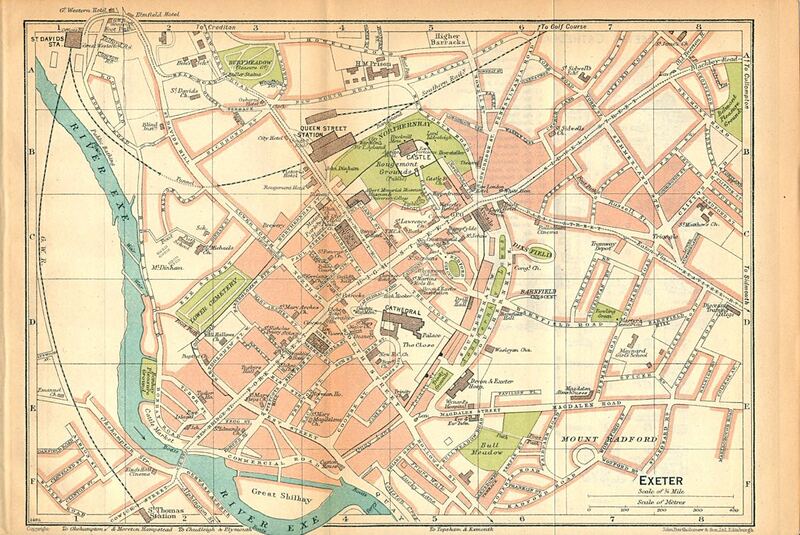 A city map pubished by John Bartholomew and Son, probably from the 1920s.